The small town of Koynanagar, nestled among the steep hills of the Western Ghats range of India, attracts visitors from miles around with its lush botanical gardens and waterfall vistas. Shortly before sunrise on the 11th of December 1967, farmers readied their oxcarts, and at the market, fires were lit to prepare the day’s first cup of chai. Then the ground started to shake. A crack 15 miles long split the ground open as shelves toppled and buildings collapsed. Within a few minutes, the small hill town had been leveled: 80% of buildings had collapsed, killing more than 170 people and injuring thousands. Geologists have puzzled over the events of that 1967 Monday morning for the past five decades. There are no known major faults in the area and, prior to the 1960s, seismicity was practically non-existent. Below the surface, the ground is made up of basaltic lava flows from the Deccan Traps sequence, directly overlying a thick basement of gneisses and granites; in other words, a stable continental interior far from the destructive tectonic stresses that characterize earthquake-prone regions around the world. What could have caused a magnitude 6.6 quake? More puzzling still: in the last fifty years, many more earthquakes have struck the area, including 22 of magnitude greater than 5.0, and hundreds of magnitude greater than 4.0. The sharp rise in seismicity following the completion of the nearby Koyna dam and filling of the Koyna reservoir in 1962 offered an easy culprit, and quickly the dam was blamed for the region’s woes. Though contentious in the 1960s, a large body of literature now exists documenting so-called “induced” seismicity, that is, generally minor earthquakes triggered by human activity, including mining, groundwater pumping, and fracking. Reservoir-induced seismicity, known since the 1930s, can be triggered by the accumulation of water in dammed lakes, with the added load of the water column causing changes to local stresses. If caused by the Koyna dam, the magnitude 6.6 Koynanagar earthquake would be the largest reservoir-induced quake ever recorded. In 1993, the completion of another dam and impoundment of the Warna reservoir just south of Koyna triggered another spike in seismicity, and renewed interest in the mechanisms of the 1967 quake. The Indian government and partner institutions initiated an ambitious project to study the source of seismicity in the Koyna region by installing instruments deep within in the crust, at the bottom of dedicated boreholes. Rock drilling has been part of human history for more than 4000 years, primarily for the purpose of reaching sources of drinkable water. Modern drilling tools were developed in the mid-1700s as the first oil-exaction wells were established. Because drilling can access rocks at depths or in environments that humans cannot reach, it has become an invaluable tool for the scientific exploration of the Earth’s crust, and even other bodies in the solar system: in 1971, the crew of the Apollo 15 mission collected a core of the lunar crust almost 8 feet in length. The deepest hole ever drilled is the Kola Superdeep Borehole in northwestern Russia. A point of Cold War pride, it reached a depth of over 12 km (40,230 ft). Instruments placed deep in boreholes have provided invaluable information about the flow of groundwater and the Earth’s heat flow. More recently, geoscientists have begun exploring the possibility of drilling through some of the Earth’s most active faults. Although this likely evokes Hollywood-level nightmare scenarios, in reality there is much to learn from instrumentation placed near active faults. Measurements of built up stress and deformation, for instance, can help us understand and mitigate earthquake hazards. Started in 2004, the San Andreas Fault Observatory at Depth (SAFOD) pioneered borehole fault observatories, and more have now been installed at some of Earth’s most destructive fault systems, such as the North Anatolian fault in Turkey (source of the devastating 1999 Izmit earthquake). Building on the success of these deep borehole observatories, the Koyna drilling program was initiated with the objective of unraveling the source and mechanisms of the Koyna-Warna earthquakes. Perhaps coincidentally, the Koyna program happened to drill through hundreds of meters of lava flows from the Deccan Traps volcanic province. Although the stated aim of the project was to install deep borehole instrumentation to understand and monitor local seismicity, project scientists were well aware of the potential goldmine a drilling project through the massive volcanic lava pile could provide for understanding events at a keystone moment in Earth’s history: the end-Cretaceous mass extinction that saw the demise of non-avian dinosaurs and a wealth of animal and plant species across the world’s continents and oceans. At first, scientific drilling through massive volcanic provinces like the Deccan Traps can seem like a counterproductive enterprise: drill holes are very small and very few in number compared to the vastness of these provinces, so much so that the venture has occasionally been compared to “pin-pricking an elephant.” But drill cores do provide advantages over surface outcrops: they represent a continuous record of the volcano’s activity without interruptions by roads or vegetation, and can reach depths below sea level that would not be otherwise accessible. Of the nine boreholes drilled for the Koyna project, all exceeded 900 m (2,950 ft) and four reached 1,500 m (4,920 ft), the most continuous sections ever observed across the province, from the contact with the underlying granitic rocks to the summit of the lava pile. With participation from the International Continental Drilling Program (an organization dedicated to continental drilling to answer scientific questions that would not easily be tackled without drilling), the Indian government has now made the Koyna cores available for study by our team as well as other international scientists. There is little doubt that the end-Cretaceous boundary is located somewhere in the lava flow sequence of the Koyna cores, and we’re thrilled to have access to such an amazing geological record of volcanism at that time. Having access to the Koyna cores opens tantalizing opportunities to test hypothesized links between the Chicxulub impact and a rapid acceleration of volcanism in the Deccan! Gupta, H.K., Arora, K., Rao, N.P., Roy, S., Tiwari, V.M., et al. 2017. 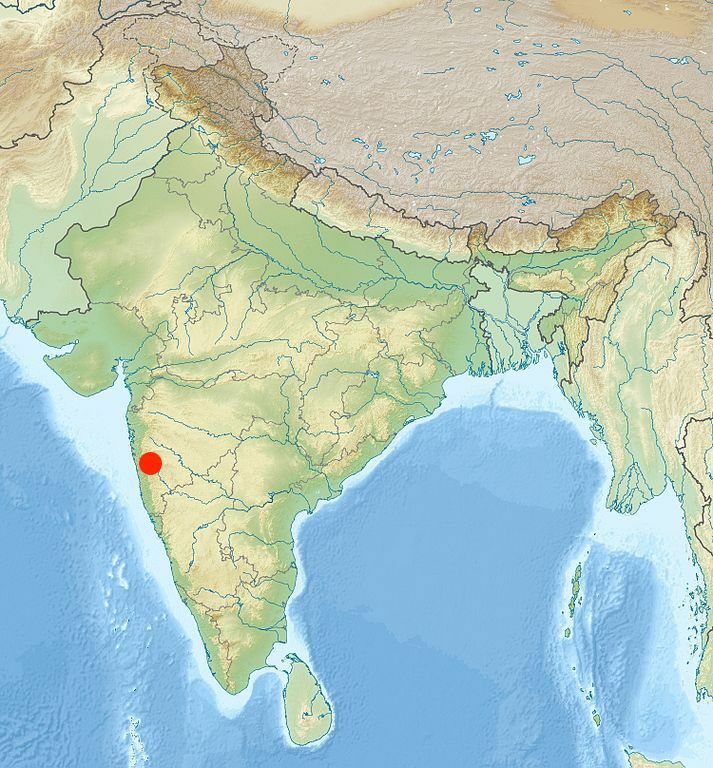 Investigations of continued reservoir triggered seismicity at Koyna, India. In: Mukherjee, S., Misra, A.A., Calvès, G. & Nemčok, M. (eds) Tectonics of the Deccan Large Igneous Province. Geological Society, London, Special Publications 445, pp. 151-188. Leif Karlstrom and I are happy to have our paper on the triggering of mid-ocean ridges published in Science Advances. We found a concentration of gravity anomalies (i.e., regions with a very slightly higher force of gravity caused by extra mass at or below Earth’s surface) on K-Pg aged seafloor in the Indian and Pacific Oceans. The simplest explanation is the eruption of ~200 m of excess basalt approximately 66 million years ago. Extending this value globally, the volume of the excess erupted material is at least several hundred thousands cubic kilometers, and could be as large as several million cubic kilometers. The amount of seafloor exhibiting small structural anomalies is plotted as a function of the age of seafloor. Trends that persist over 10 My have been subtracted to highlight transient features, and only high spreading rates are plotted here. The highest peak – indicating the production of 8% more anomalous seafloor than on average – occurs at 66 My and is coincident with the age of the Chicxulub meteorite impact. Based on the age of seafloor where we observe the anomaly and the lack of a similar episode in the last 100 Myr, we think the best explanation is the triggering of magmatism by the Chicxulub impact. Seismic waves from the impact appear capable of liberating the melt stored at mantle depths beneath mid-ocean ridges. This is similar to the proposed triggering of the largest eruptions in the Deccan Traps, and represents yet another line of evidence supporting the idea that the Chicxulub meteor impact dramatically affected not just life on Earth, but Earth’s geological activity as well. Take a look at the abstract for details. 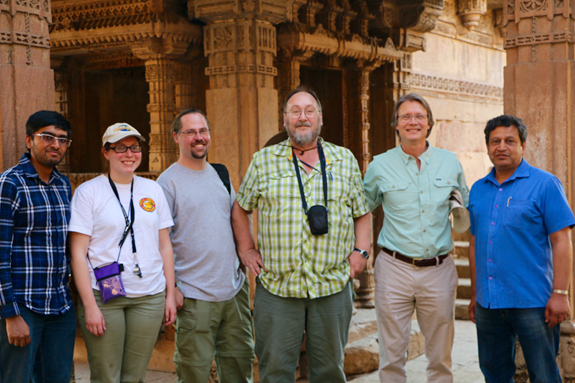 Researchers Tushar Mittal, Courtney Sprain, Loÿc Vanderkluyson, Paul Renne, me (Mark Richards), and Kanchan Pande visiting a step well near our field site in Ahmedabad, Gujarat State, India. The carved stones behind us are not Deccan basalts, but they are very impressive! I am pleased to welcome you to this website, which chronicles our team’s research on what seems to have been a rather disastrous time in Earth history, the end-Cretaceous. Here, we will present the activities and scientific results of our NSF-funded project to explore the nature, physical mechanisms, and precise timing of the enormous Deccan Traps flood basalts of northwestern India. We are finding that the main phase of these volcanic eruptions, the largest of the past 100 million years of Earth history, correspond with ever-increasing precision in time with the large Chicxulub meteor impact in Yucatán, México, and therefore also to the extermination of the non-avian dinosaurs and about 70% of all species in the fossil record 66.04 (+/-.03) million years ago. The tantalizing implication that the impact may have influenced the Deccan eruptions is a major focus of our current research. This website will keep you up to date with our fieldwork, geophysical modeling, geochemical and geochronological analyses, and our database and publications. Moreover, we will be highlighting the many individuals involved in the project, including graduate students, postdocs, and a number of distinguished international collaborators. Check back here for the latest updates on our work. National Science Foundation Award ID EAR-1615203. Log in | © 2019 University of California Regents. All Rights Reserved.